Cinematic Paradox: Life. Liberty. Vengeance. Django Unchained (2012) / US / Out in cinemas now / Written and directed by Quentin Tarantino / Starring Jamie Foxx, Christoph Waltz, Leonardo DiCaprio, Kerry Washington, Samuel L. Jackson, Don Johnson, Walter Goggins / 165 mins. Quentin Tarantino was my first big director 'obsession', even though when I first saw Pulp Fiction at age 12 - a movie which I'm still not legally allowed to see - I didn't understand it but I was more than happy to proclaim my love for the guy. Since then, I've seen the large majority of his films and pretty much loved every single one, for they don't really have a set genre where they can easily fit in and there's pretty much no way you can really describe how a Tarantino film works. Much like it has been with Christopher Nolan, each new Tarantino film has become an event for me, but particularly in the case of Django Unchained. This film was the first of his I've ever legally been allowed to see in cinemas, and also the first first-time viewing of a Tarantino film I've ever legally done age-wise. I feel like I've been missing out on something for such a long time, since seeing Django Unchained, in all it's bloody Tarantino glory, was the most fun I'd had in a cinema in a long time. Which makes me sad, because considering how much I love Inglourious Basterds, I can only imagine how I'd probably just about pass out from all the fun and excitement. Django Unchained follows slave Django (Jamie Foxx) in the South of America in 1858, who is acquired by German bounty hunter Dr. King Schultz (Christoph Waltz) to help him find the Brittle brothers. 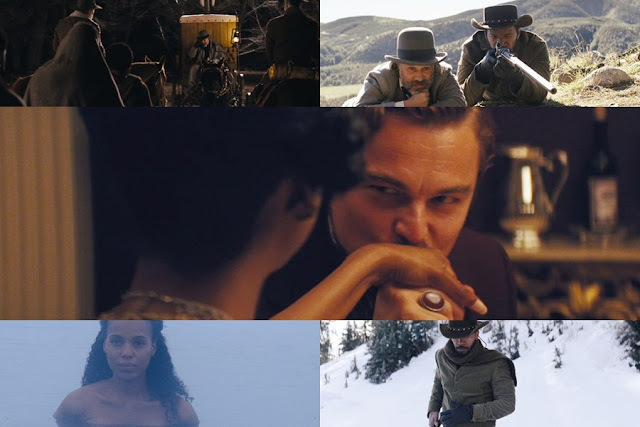 Since Schultz has made Django a free man, Django sees this as an opportunity to go and rescue his wife, Broomhilda (Kerry Washington), who is currently working for the rather evil Calvin Candie (Leonardo DiCaprio) at his plantation. And that's basically it, but it sure does fill up 165 minutes. While I enjoyed the crap out of this movie, that 165 minutes wasn't exactly ideal for me. The other day I was looking at all of the movies playing at the cinemas at the moment, and the only ones that were under 2 hours were kids films, and half of them were over 2 and a half hours. If the movie entertains me - and hey, I still enjoy the crap out of The Dark Knight Rises even though I've seen it four or five times, which is like half a day out of my life dedicated to that movie - then that's okay. But movies are just getting longer and longer, which is a hard deal when people eventually get them out on DVD and have more chances to be distracted. I imagine that will be the case with Django Unchained, which is immensely entertaining, but I swear in that final act there were about five different occasions in which the film could have ended. I get that we had to tie up the revenge story because hey, that's just how a Tarantino film works, but he kept setting up the film for an epic end, and then we had another half an hour to go. I wouldn't say the content we got wasn't entertaining - because it really was, and the ending was completely satisfying in every way - it was just a little exhausting. Everything leading up to that is consistently entertaining though, so I don't think people will be checking out early on...I hope. 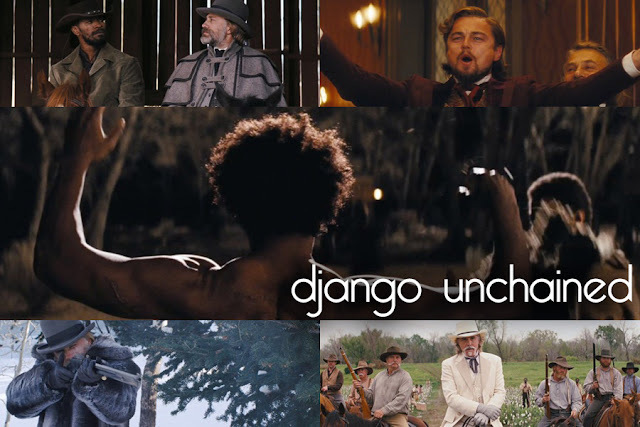 Aside from that gripe, it is a little hard to write about Django Unchained without going totally insane. All you need to know is that during that scene with the bagheads, I just about started hyperventilating from how much I was laughing (so rare do I laugh in cinemas, coz I'm scared no one else will laugh). Only in a Tarantino film would that scene happen. And that wasn't the only time I was just loving life while being in that cinema. While there were more than enough funnies to cover at least 10 laugh-less comedies that were also released in 2012, the film also has a stunning dramatic verve, which gives the revenge story some weight. 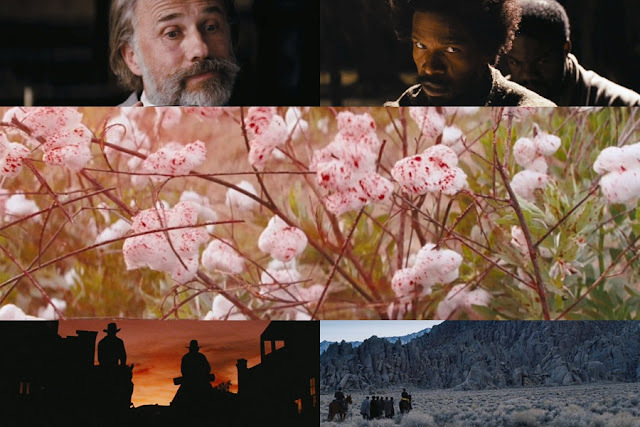 With all of the exploitation styling of the aesthetics, the pulpy western tone and the obviously great soundtrack, Django Unchained is indeed a very unique film, which has unique characters and performances to match. Had this year's Best Actor race been a little less congested, I wouldn't hesitate in putting Jamie Foxx up for consideration. He was excellent as our hero, turning in a layered performance that isn't reduced to just the usual 'let's shoot everyone right now' kind of thing. This can also be said of Kerry Washington, who plays the 'princess locked in the dungeon' type, but her depth into the character is enough to make sure she doesn't succumb to the stereotype. Samuel L. Jackson was rather hilarious as Stephen, Candie's loyal house slave, who hates black people just as much as his master. Jackson achieved his goal of being one of the most "despicable black people on film". To be honest, I forgot it was even him on screen under that wooly white sheep stuff he had all over his head. The two standouts are easy, though - Leonardo DiCaprio and Christoph Waltz. I'd totally be okay with Christoph Waltz winning another Oscar for his work as King Schultz. This is no Hans Landa business, and it is probably the first English speaking role that Waltz has had where he hasn't played an antagonistic character (but hey, he's so good at that). Schultz is an enigmatic, charismatic character who is fascinating to watch as he starts to lose himself once he gets to Candieland. Waltz plays him with the enigma and charisma that he's always had, but sometimes isn't allowed to fully shine in the fairly standard villain roles he signed onto in the likes of The Green Hornet, Water for Elephants and The Three Musketeers. Leonardo DiCaprio also plays a character unlike anything he's ever played before: being the film's main villain. Calvin Candie is very charming, a wannabe Francophile, but also extremely brutal through his love of Mandingo fighting and the power he holds over everyone. I wouldn't say that this is Leo's best performance - as that's still reserved for What's Eating Gilbert Grape - but he's so damn great in this film that he really should have been nominated for that Oscar, no matter what. That scene where he cuts his hand open with that broken glass was absolutely terrifying, mainly with the knowledge that he managed to incorporate it into that scene to build the brutality of his character. Come on guys, Leo was so deserving. But without him there, I've got my Team Waltz t-shirts all sorted for Oscar night. There's really not much else I can say - my first Tarantino cinema experience was everything I wanted it to be. I laughed, I cried, I laughed til I cried. Most of all, I was just having the time of my life. It wasn't perfect, but it is not often I get entertained that much. Great review Sati- Your first Tarantino? really? glad to see you loved it, it's definitely one of my favorites, too! Mmmmmm, I'm not Sati, haha. And no, not my first Tarantino, just the first one I've seen in cinemas. I did clearly state that one, even if the rest of the review was admittedly pretty bad. Glad you enjoyed it. I agree the length works against it, but I loved the film overall. And DiCaprio was fantastic! Yeah, the length kinda makes it come undone, but then again, we wouldn't have such a satisfying finale. Mind you, that whole mining thing could have been cut out and the end could have happened just after that big shootout...IDK, I'm not sure there's really a great solution to the length. Love the Christopher Waltz rating for a Christopher Waltz movie! I pretty much agree with everything said here - actually it was my first Tarantino cinema experience too. Not my favourite of his surely, nor my favourite DiCaprio performance, but that doesn't make the movie any less awesome. 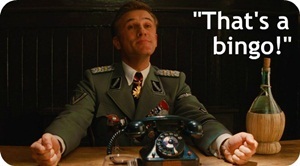 Haha, that's coz Christoph Waltz is just amazing! Yeah, this one falls far behind the likes of Inglourious Basterds and Pulp Fiction but man, did I have a good time watching it. I would have been happy if Leo won the Oscar for this - which he really deserved to - even as a consolation for the countless other great performances he's turned in.